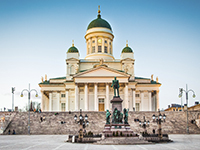 Finland offers a unique blend of attractions for visitors. Santa Claus Village is a hugely popular amusement park, while Helsinki Senate Square and Uspenski Cathedral, Helsinki are among the displays of impressive architecture on offer. Finland can be accessed from the United Kingdom either by airplane, ferry and train or car, with travel times very much dependent on your choice of travel. Travelling by car from Hull to Finland can take 31 hours out of your holiday, although you do get to pass through Germany and Sweden along the way. Non-stop flights from Manchester to Helsinki, meanwhile, can take just under three hours. Otherwise, the stops your airline makes will differ as to how long this journey would be, with one-stop trips taking between five and 13 hours. There is no direct ferry from the UK to Finland, but the train can be taken over three days from London to Stockholm, from which the ferry can then be travelled on to Finland. If you are unsure as to how to adjust your diabetes management while travelling to Finland then you should discuss a plan with your diabetic specialist. The time difference in Finland is two hours ahead of British Summer Time and three hours ahead of Greenwich Mean Time. This shouldn’t require any major changes to your diabetes management. The winters in Finland can be quite harsh due to the severe cold, which averages temperatures hovering around freezing point. In the summer, the climate rises to an average of 17°C. The Euro is the currency of Finland, with ATMs scattered all across the country. Banks are open on weekdays from 1000-1630, but are closed on Saturdays, Sundays and public holidays. The word for 'bank' in Finnish is 'pankki'. There are no mandatory vaccinations required to enter Finland, however rabies is present in bats and other mammals in Finland, so it is advised for those planning activities in remote areas that put them at risk for bat bites to receive a rabies vaccine. Finland is amongst the European countries that allow you to receive state healthcare either at a reduced cost or sometimes for free. It will cover you for medical treatment until you return to the UK. Medication is available in Finland, but payment is required from a pharmacy, for which the Finnish translation is ‘Aptekki’. However, possessing an EHIC card allows you to receive treatment at a lesser cost and this money can be recouped when you get back into the UK. Pharmacies are generally open during normal working hours, though each town has one pharmacy that stays open later than the others. Blood and urine testing kits are available from many pharmacies in Finland. You may not always find blood and urine testing equipment in Finnish pharmacies but you should be able to obtain it from a health centre in an emergency. Many local branches of the Finnish Diabetic Association will sell blood testing equipment as well. The emergency services number to be called in Finland is 112. An ambulance is called “ambulanssi” in Finnish. It is advisable to contact the manufacturing company of your medication prior to leaving the UK to find out what is available in Finland if your medication gets lost, stolen or damaged. It is also worth checking to see what different names your medication may be listed as. You should note which syringes are available in Finland, with U-100 syringes the most commonly used. The one diabetic association of Finland is the Finnish Diabetes Association, which has been a member of the Internal Diabetes Federation since 1950. What sugar free drinks are available in Finland? Many brands of diet soft drinks and artificially sweetened juices are widely available.